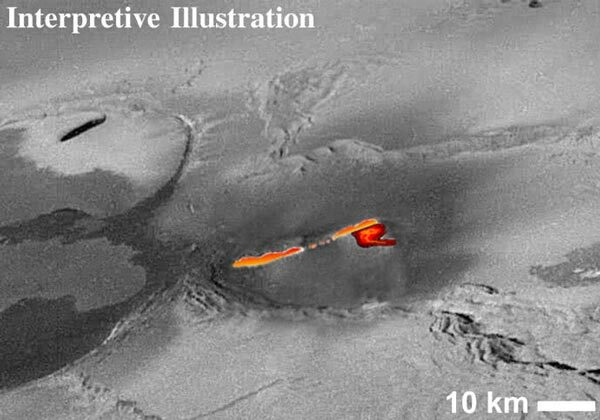 Opis: A lava fountain shooting over a kilometer high has been discovered on Jupiter's moon Io. The robot Galileo spacecraft orbiting Jupiter photographed the volcanic eruption during its close flyby of the moon late last month. The fountain is visible in the above mosaic of images from the flyby. The lava plume was so bright it saturated Galileo's camera, and so has been digitally reconstructed in false color. The hot lava appears to be shooting from a 20-kilometer long canyon on Io's active surface.